It's Easter already! Season of newness, warmer days and lots and lots of chocolate. Hurrah!!! I love Easter time. 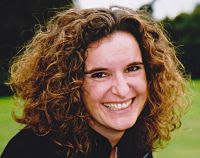 It firmly ends the winter months and because of the long weekend, allows for extra time in the garden, away or just out and about, often without the burden of thick winter coats (fingers crossed). The world seems to start smiling again and the tenseness that comes with the cold starts to ebb away. It is a great time to rejuvenate and to spend time with family and friends sharing foodie treats and being social. 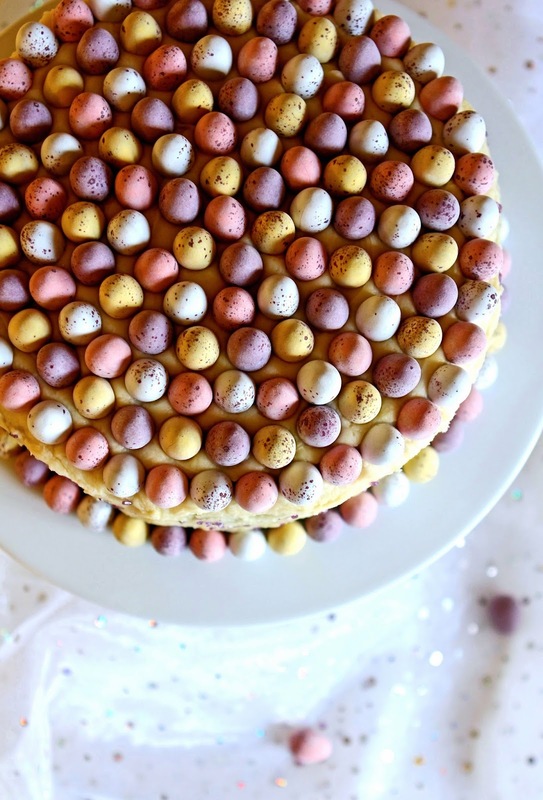 Traditional Easter cakes, such as Simnel cake, tend to centre around fruit mixes. Although I enjoy an occasional slice of fruit cake, it never quite hits the height of decadence and celebration. For me, chocolate is the way to go to honour any anniversary or festival........ the richer, darker and more moist the better. Even our wedding cake was chocolate...... all three layers of it! 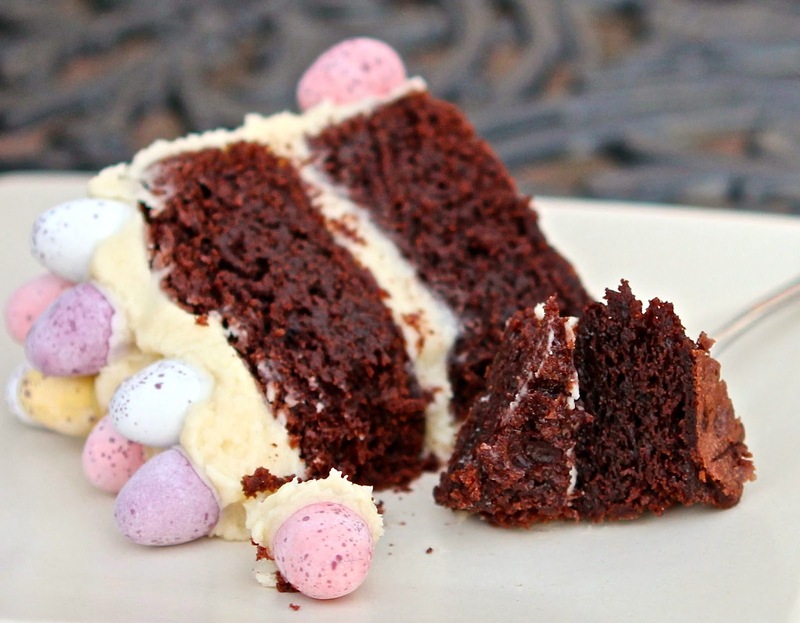 This Mocha Easter Cake is incredibly rich and most definitely very very chocolatey. A small slice goes a long way............... perfect for sharing. Made with plenty of dark chocolate as well as a dose of cocoa, it gains extra depth from a splash of fresh-brewed coffee. The texture is slightly brownie-like............ quite dense, very moist and a bit sticky.......... but is much lighter. The batter makes fantastically fluffy cupcakes too! The sponge is, interestingly, not over-sweet and the coffee gives a delightful slightly bitter kick which contrasts beautifully against the creamy, sugary frosting and seems to intensify the darkness of the chocolate. 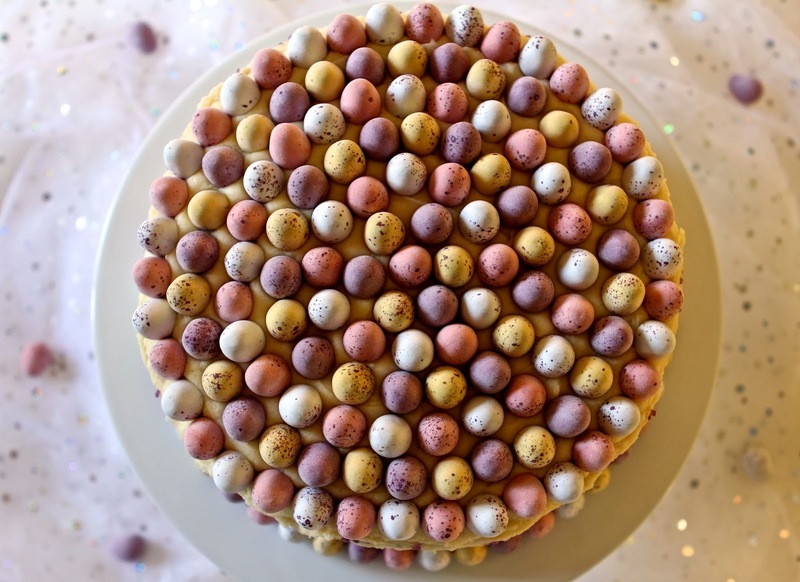 I will admit that I have probably gone a tad over-board with the extent of egg-decoration on this cake............... Each slice probably gives you a fun-size bag of eggs, albeit on top of the cake. But what is Easter without sugar overload? And they do look so pretty and fun! 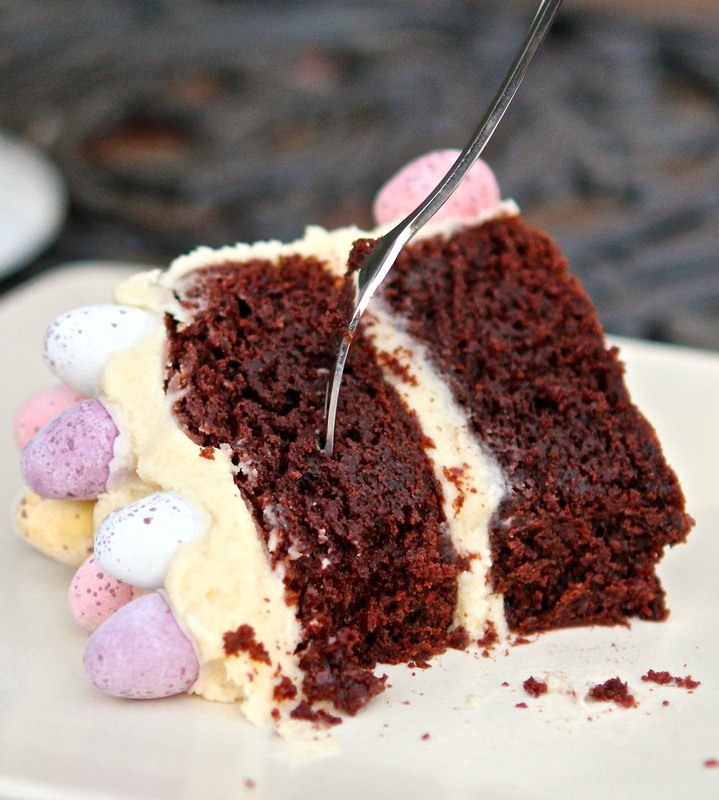 First up : Jibber Jabber's Love Cake challenge - the theme being a very seasonal 'Springing into Easter'. 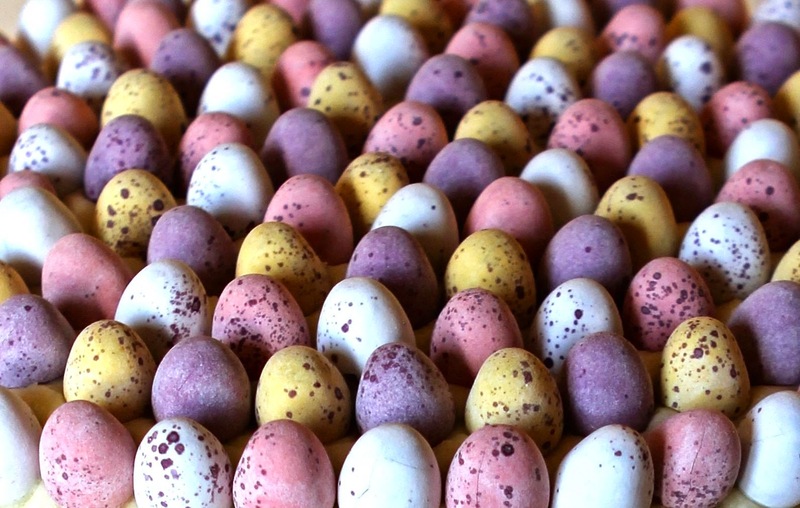 One of the things I love about Mini Eggs is the lovely pastel colours of the candy shells which shout Spring and they most definitely exude Easter too! Next I am entering it into Nayna's Simply Food event : Let's Cook Sweet Treats for Easter. 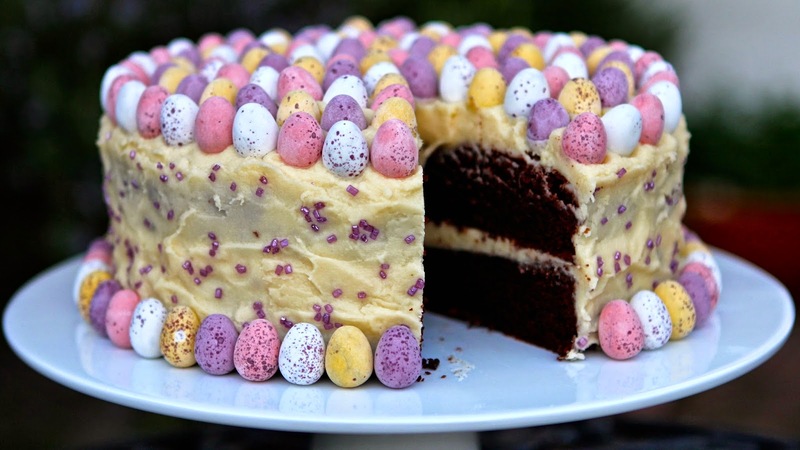 This cake is definitely sweet, an absolute treat and very Easter! 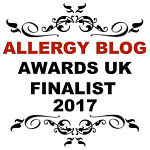 And finally, I am offering this as my second entry this month to We Should Cocoa being hosted by Rachel Cotterill on behalf of Choclette at the Chocolate Log Blog. Unsurprisingly, April's theme is a very chocolatey Easter! So Happy Easter all. Have loads of fun and enjoy all that chocolate guilt free and while it lasts!!! Base-line two round 8 inch baking tins with baking paper. In a medium glass bowl, break the chocolate into pieces and add the butter and coffee. Melt together either over a saucepan of simmering water or in a microwave at medium heat on 30 second bursts, stirring frequently, until fully blended. Set aside. 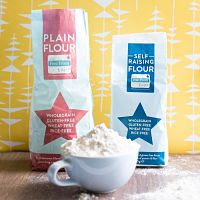 In a separate bowl, mix together the flour, xanthan gum, baking powder, bicarbonate of soda, salt, sugars and cocoa powder, making sure any lumps are completely broken down. In a small cup or jug, mix the milk with the vinegar and leave to stand for a few minutes. Whisk the eggs in a large bowl until thickened slightly and pale in colour. Add the vanilla extract, melted chocolate and milk mixtures and continue to whisk until smooth and fully combined. Add the dry ingredients and fold gently until fully amalgamated. Do not over-mix. Pour the batter into the cake tins, ensuring an even distribution. Bake for 50 minutes to an hour in the centre of the oven, until a skewer inserted into the centre comes out clean. Remove from the oven and leave to cool in the tins for about 15 minutes before turning onto a wire rack to cool completely. To make the frosting, beat the butter with the vanilla extract until smooth. Gradually add the icing sugar and milk a little at a time and beat until you have a smooth frosting paste with a good spreading consistency. Sandwich the cakes together with frosting and then use the remaining frosting to cover the cake completely, smoothing the sides with a palette knife and spreading a thicker layer on the top. 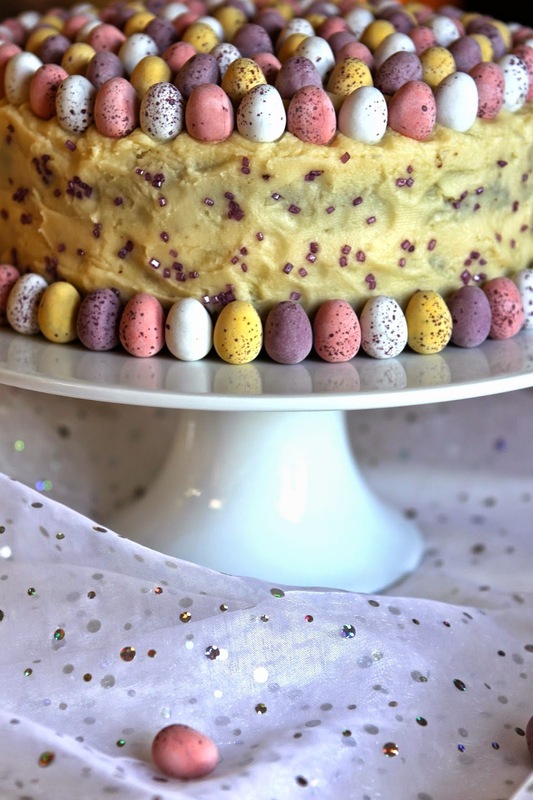 Decorate with mini eggs and sprinkles. Noooooo! You can never go overboard with mini egg decoration. It's definitely an integral part! Ha! Thanks for your confidence Laura. I ate them and trust me......... there were a lot! Thanks Katie. Happy Easter to you too! This looks awesome! Yeah, I dnt do fruit in cake either...No. I'd much prefer this any day of the week. Plus u have very thing u need dark choc, cocoa and the coffee AKA the perfect chocolate cake!! Love the decorations it so nice and neat. Thanks. It was pretty delicious! Chocolate is so much more decadent than fruit! Isn't that the prettiest cake? 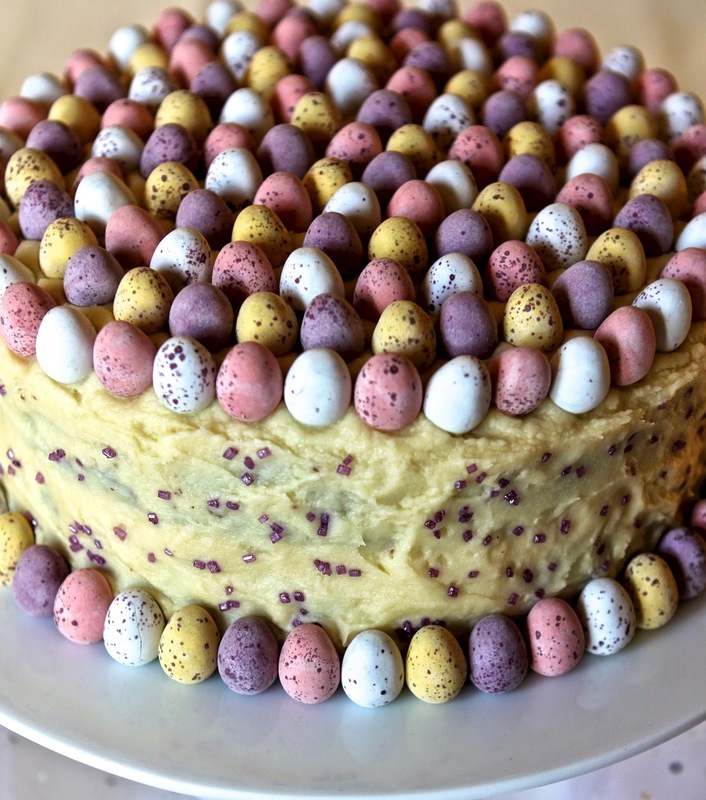 What I love is the ring of eggs around the base of the cake - like a pearl necklace! Thank you CC. That is such a lovely description! 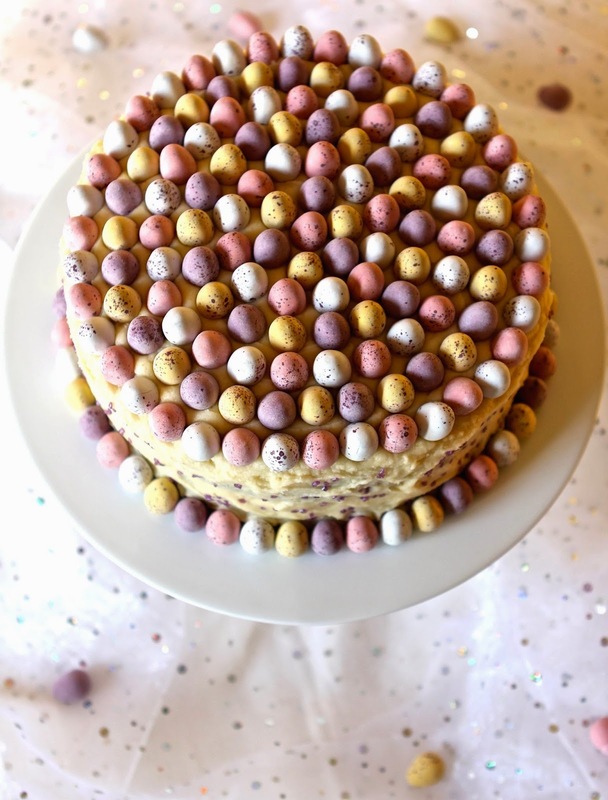 Oh goodness, that is a true Easter egg cake - love the idea of getting a packet of eggs with every slice. The cake looks really delicious too - you had me at brownie like. I'm not really a coffee fan, but do find it works really well in chocolate cakes. Thanks for entering this into WSC. You're welcome Choclette. I think I probably put on a few pounds eating it (as did all the people I shared it with) but it was worth every calorie! This looks truly magnificent! I agree that the pastel colours of the Mini Eggs really are evocative of Spring and thus an essential decoration! Thanks for linking up with this month's Love Cake. You're welcome.... thanks for hosting!